Sometimes the solution to a problem is in one's own backyard. 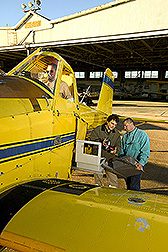 For agricultural engineer Steven J. Thomson, readily available agricultural airplanes provided a solution to the need for high-resolution images as part of remote sensing techniques for the Mississippi Delta. Thomson, located in the ARS Application and Production Technology Research Unit in Stoneville, Mississippi, is applying remote sensing technology using agricultural aircraft to projects as diverse as managing crop water stress, controlling invasive imported fire ants, and producing catfish. "Remote sensing has opened a new window on our understanding of the Earth, its climate and natural resources, and the effects of our activities over the past 30 years," says Mark A. Weltz, ARS national program leader for watershed and remote sensing research. "But we're still learning how to extract the vast amount of information that's available and apply it to agricultural systems in cost-effective ways." Thomson first developed the method to collect field images as part of a practice known as precision agriculture. The idea is to determine which areas of a field require more attention by growers of cotton, soybeans, corn, and other crops. This helps growers save on input costs, such as fertilizer and pesticide, and reduces the amount of pollutants that could potentially run off into the environment. Thomson would like to use this system as a substitute for, or to supplement images obtained by, general aviation aircraft. "An advantage of agricultural aircraft is that they're much easier to schedule for frequent remote sensing because they're used in the field for spray operations anyway. The imaging system essentially gets a free ride. The setup includes an ergonomic control to allow for easy operation by the pilot with minimal distraction." A slide-mounted box, approved by the Federal Aviation Administration, houses the camera, he says. The new system is being studied for several applications, such as detecting weeds in cotton and soybean fields using digital video and spotting nutrient or water stress in crops using thermal imaging. The researchers configured and mounted standard digital video, multispectral, and thermal-imaging cameras on the aircraft. The cameras give scientists the ability to "see" reflected and thermally emitted electromagnetic waves not otherwise visible to the human eye, according to Thomson. The plane can also be equipped with digital still cameras, which can have higher resolution than video cameras. A computer program uses a Global Positioning System (GPS) to determine when the plane passes over a desired area of the field and activates the camera's shutter. The slight lag time that occurs with digital camera shutters is accounted for in the program. 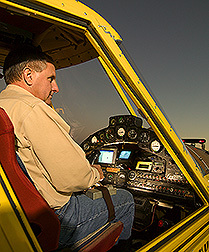 Agricultural aircraft can be flown much lower than larger planes. "Flying low avoids interference experienced with satellite images, which requires atmospheric corrections," Thomson says. But low flights limit the ability to capture images of large areas all at once. That problem is overcome by "mosaicing," which involves making multiple flights over the site and assembling many images taken over different portions. The challenge is to define the altitude that will result in the best images in terms of size, resolution, and area covered. Thomson and colleagues in the ARS Southern Weed Science Research Unit, also in Stoneville, were able to distinguish between different weed species and cotton and soybean plants in field studies. This demonstrates the feasibility of using planes or ground sprayers to apply as little pesticide as needed. Using digital data, the researchers could spot weeds among early cotton at an altitude of 65 meters (about 215 feet). Thermal images of cotton fields may help identify practices that favor higher soil temperatures. Warmer soil correlates with earlier emergence, which can benefit crop vigor in early-season cotton. Water stress is a familiar problem to growers in the Mississippi Delta. It is more difficult to detect crop water status by remote sensing in humid climates than in semiarid climates because of limited canopy cooling by evaporation. At the same time they are being used to spray pesticides, agricultural planes can be used to obtain canopy heat signatures to assist in irrigation scheduling. Another major problem for farmers and ranchers in parts of the Midsouth are imported fire ants—red, black, and a hybrid of the two. Their painful stings can ultimately lead to death for some people and newborn livestock. Thomson is helping Stoneville researchers learn more about the ants' behavior so they can develop more effective biological control methods. They know that fire ant mounds heat up in morning hours more quickly than the surrounding soil does. So the researchers are using thermal cameras to measure infrared emission (heat) and locate the mounds, which appear as bright spots in images taken from above. Aquaculture could also benefit from remote-sensing methods. Thomson and Paul Zimba of the Catfish Genetics Research Unit in Stoneville are studying a way to detect harmful algal species in catfish production ponds before the problem gets out of hand. The researchers can now identify specific types of algae by color, visible on digital video shot during the low-altitude flights. Unwanted algae are distinguishable by their chlorophyll and carotenoid compounds. With enough data, the scientists can predict when certain types of algae are present. Another project is to find out why double-crested cormorants tend to pluck catfish fingerlings out of some ponds but not others. Thomson and Andy Radomski of the Harry K. Dupree National Aquaculture Research Center in Stuttgart, Arkansas, think pond color and condition may have some effect.—By Jim Core, Agricultural Research Service Information Staff. This research is part of Crop Production (#305) and Integrated Agricultural Systems (#207), two ARS National Programs described on the World Wide Web at www.nps.ars.usda.gov. 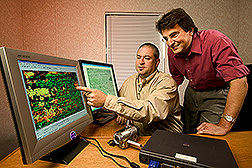 Steven J. Thomson is in the USDA-ARS Application and Production Technology Research Unit, P.O. Box 36, 141 Experiment Station Rd., Stoneville, MS 38776; phone (662) 686-5240, fax (662) 686-5372. "Agricultural Aircraft Offer a Different View of Remote Sensing" was published in the March 2005 issue of Agricultural Research magazine.